Synapse Electronic, an employer of choice! Synapse Electronics is much more than a simple work space, it is also a pleasant and friendly place. We try and make sure that everyone feels good about working here, because we consider that a contented staff is the key to our success. A terrace with BBQ on the roof for sunny lunch breaks and 5 to 7 happy hours. In addition, a number of activities are organized annually by the company. It’s one of the ways we thank our staff, but it also reinforces links between colleagues and promotes a sense of belonging. 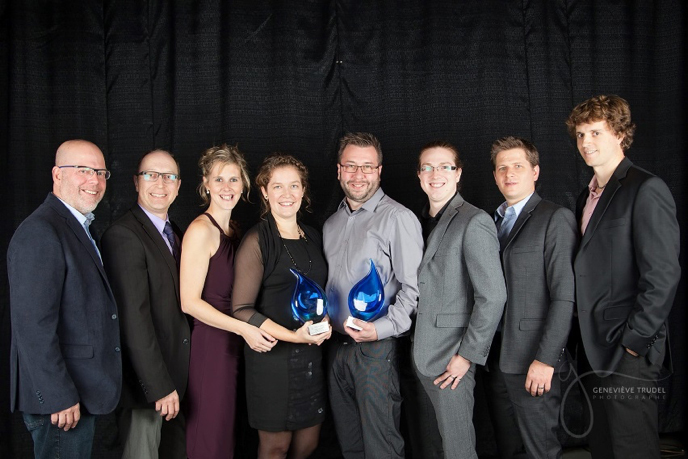 It is with great pride that we received the “Employer of Choice” award as well as the “Manufacturing Company” award at the 23rd Gala Distinction Desjardins 2016 from the Shawinigan Chamber of Commerce & Industry. Work for an important manufacturer of electronic circuitry. Get a salary and benefits equivalent to those in major urban centres while living nearby. Pursue your career in the Mauricie and enjoy an accessible and exceptional quality of life. The Mauricie region is famous for its large green spaces, its activities and its vibrant cultural community.